It wasn’t exactly deep waters, but for the first time in his young career Joey Spencer had a fight go past the third round. Spencer, one of the top prospects in boxing, turned in a lackluster performance on Saturday during a six-round fight that wasn’t supposed to go the distance at the Armory in Minneapolis. But Spencer did enough to defeat Osias Vasquez by unanimous decision (60-52, 60-52, 59-53) in the Peter Quillin-Caleb Truax PBC undercard on FS1. After coming out swinging in the opening two rounds, Spencer’s work rate drastically decreased. But it wasn’t all bad for Spencer, who entered Saturday with only nine rounds of work in six pro fights. In the second round, Spencer displayed his power after knocking out Vasquez’s mouthpiece with a right hook. Spencer has quickly made a name for himself since turning pro 14 months ago. 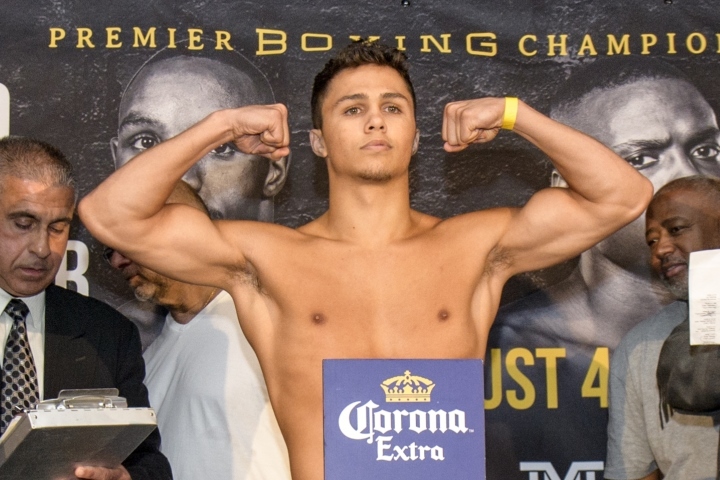 With all seven of his professional bouts televised, expectations are high on the teen prospect. Saturday wasn’t the first time Spencer had a fight at the Armory. He fought at the Minneapolis venue for his second pro bout when he knocked out Ousmane Sylla in the first round. "The Armory is a great venue with great energy,” Spencer said before the bout. “I've fought here before and I'm looking forward to coming out and putting on another great performance for this Minneapolis crowd." It wasn’t the performance Spencer wanted, but the ceiling is still very high for the 19-year-old from Michigan. He’ll get many more opportunities to put on great performances at many venues across the country. But first, he’ll need to work on his conditioning, because the knockout punch won’t always be there. PBC has way better prospects than this dude. Not impressed. That did not look good. Joey waited, he was straight up, no angles or recourse. That isn't going far. He's not a prospect. He's green and has power against those who know nothing about self defense.